The club hopes to have enough funds to soon have a table in the G-lounge. Photo Daren Zomerman. 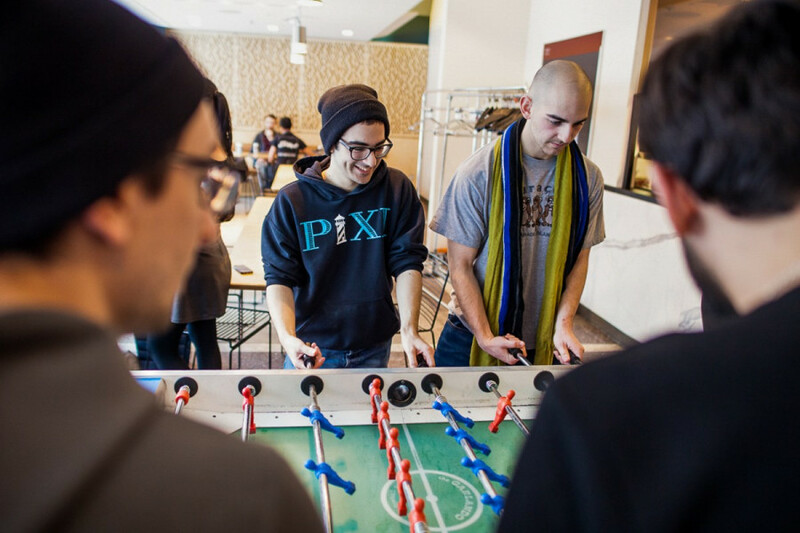 When asked where to meet for an interview, Concordia Foosball Club founder Eloy Tripetujan suggested Reggie’s, the only place on campus with a foosball table. According to Tripetujan, the table is rusty and uneven, making it harder to play. Another member of the club, Jordan Lahmy, added that is has little of what a table would need to be good. The club was officially granted club status by the Concordia Student Union in the fall semester, but Tripetujan wasn’t able to get it started until now. Related: Ultimate Frisbee is the Utopian Sport of the Future. To buy a foosball table and really get the club on its feet, Tripetujan has been organizing bake sales. The club has also received funding from the CSU. Lahmy is enthusiastic about helping the club grow. According to Tripetujan, he has raised about half of the money he needs to get a quality table—which would cost about $2,000. “I’m trying to get the money by the end of the semester but if I can’t then hopefully next year I will for sure,” he continued. The foosball club aims to be able to put on events and organize tournaments where participants would compete for prizes. Tripetujan has already gotten permission to set up a table in the G-Lounge at the Loyola campus. He says that his goal is to create a space for people to “chill out” and meet each other. Related: Concordia’s Dragon Boat Team Paddles With a Purpose. Lahmy, a former Concordia student, believes that the G-Lounge would be one of the better spots for the club to meet. Until the club gets a table, the dream is dead as Reggie’s charges the club to hold their events. By paying to hold their events, the club loses the money they’d use to buy their table.